A dental implant is a "root" device, usually made of titanium, used in dentistry to support restorations that resemble a tooth or group of teeth to replace missing teeth. It can be used to support a number of dental prostheses, including crowns, implant-supported bridges or dentures. 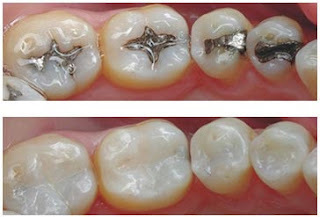 They can also be used as anchorage for orthodontic tooth movement. 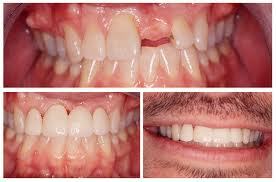 The use of dental implants permits unidirectional tooth movement without reciprocal action. Dental implants are made of a variety of materials, such as titanium, aluminium oxide and surgical stainless steel. The devices are firmly attached to the jaw bone through surgery and implant posts provide a comfortable, stable support on which artificial teeth can be secured. 1) An endosteal implant is placed directly into the bone, like natural tooth roots and can be used for many purposes. A single pin can be inserted through an existing tooth to strengthen and stabilize it. Other styles can provide an anchor for one or more artificial teeth. 2) A subperiosteal implant consist of a metal frame that is fitted onto the jawbone just below the gum tissue. As the gums heal, the frame becomes fixed to the jawbone. Posts, which are attached to the frame, protrude through the gums. As with Endothelial implants, artificial teeth are then mounted to the posts. Dental treatment at Thangam's Dental Clinic, India is inexpensive as compared to USA,UK, Canada, Australia etc. It is situated in Chennai, Tamil Nadu, which is considered as the Medical Tourism capital of India. Our clinic with state of art equipments and well trained experienced doctors match the best of international standards.